Here’s an incredibly easy recipe for How to Create an Easy Crudité Platter! I love them because they look absolutely stunning, with very little effort! You don’t need to cook or mix anything, just cut, serve and enjoy! 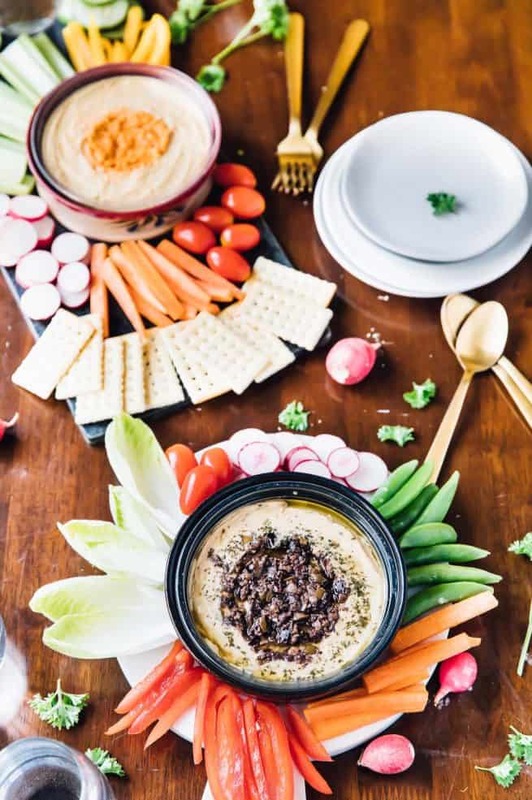 This platter features amazing hummus dips and crunchy, easy-to-prep veggies! This post is sponsored by Sabra Hummus. All opinions are 100% mine. Thank you for supporting the brands that support Jessica in the Kitchen! Can you believe it’s almost a month until the start of summer?! If you’re like me, then you’re probably already planning your summer entertainment. Pool parties, cool drinks, no bake treats, and of course, easy platters to serve for day parties and even night events. If you’re also like me, you actually want to spend time genuinely enjoying your own parties, while creating amazing dishes for your guests. This is where this crudité platter comes in friends. 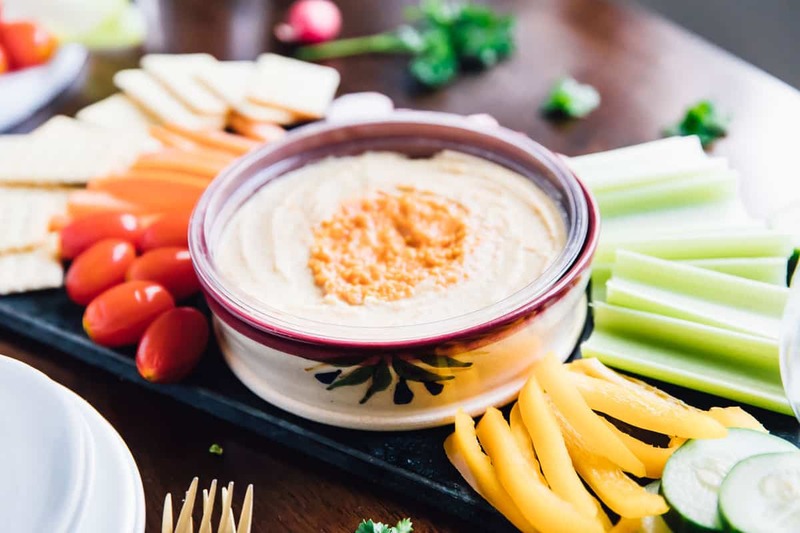 Quick background: a crudité (crudité means raw vegetables, or veggies that have been quickly blanched) platter is usually an easy-to-assemble vegetable platter served with amazing dips to accompany the vegetables. I love them because they look absolutely stunning, with very little effort! 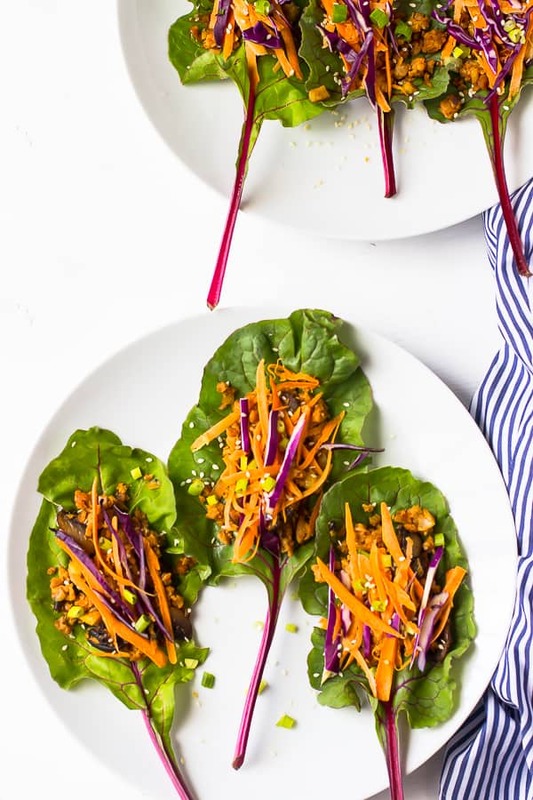 You want vegetables that are easy-to-dip and bite, such as carrots, bell peppers, radishes etc. We’ll get exactly in to what I used below. You’ll also want dips are that incredibly easy to make or serve and that thoroughly enhance the vegetables. My choice for this platter was Sabra Hummus. For me, these Sabra Hummus 10oz tubs take these already easy platters to next level easy. Sabra Hummus is definitely the perfect addition for any summer entertaining occasions. There’s no prep involved, just adding them to your already beautiful platter. 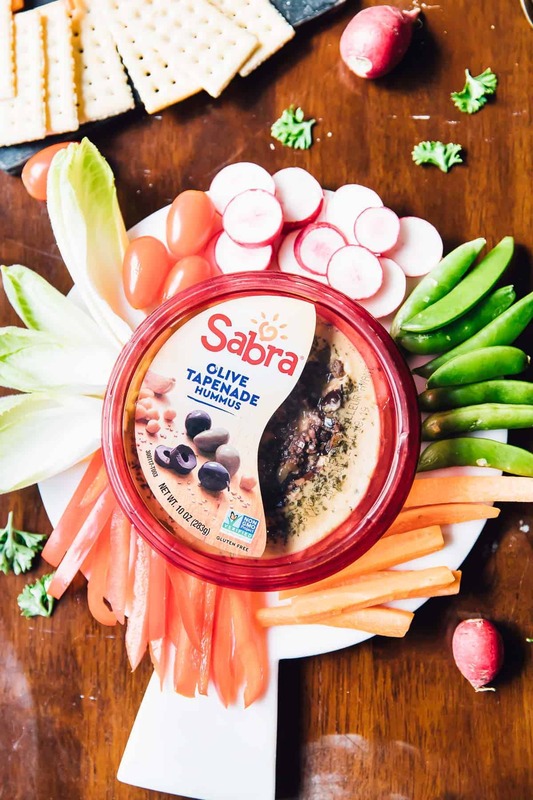 If you’ve never tried Sabra Hummus, let me tell you the short but powerful story of the first time we tried Sabra with vegetables. Gav, my mom and I have always been snackers. I used to eat Sabra Hummus whenever mom bought it as a teenager, but for some reason this moment, where we all ate it with some fresh veggies from the farmer’s market, really stands out. My mom, Gav and I literally stood around the Sabra Hummus (I think it was the Roasted Red Pepper Hummus flavour) with some veggies and snacked away. Loaded with so much incredible flavour, the hummus definitely impressed us. I had always had it before on crackers or with pita chips, so it was nice to know that it enhanced veggies so well. After that day, my mom always had a Sabra Hummus in her fridge. It even became our own little kind of thing that if we were going to the supermarket, we’d pick up one for her, and vice versa. 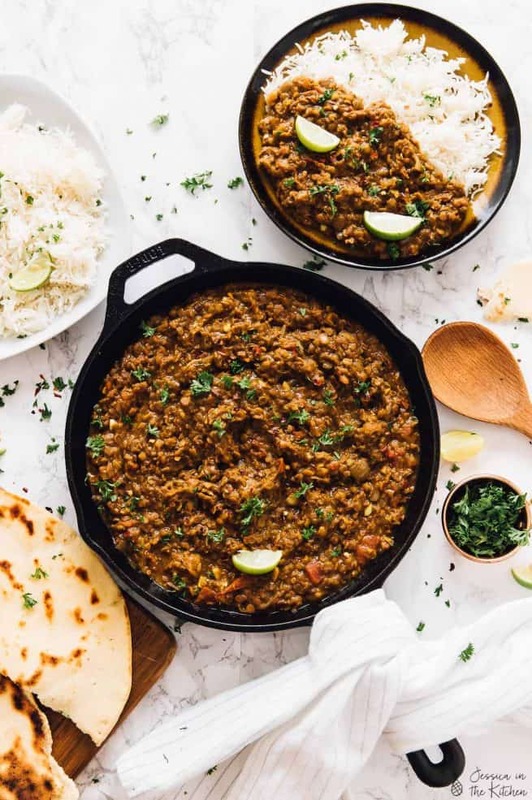 Never doubt the power of delicious food to bring family members even closer together. Now let’s get into what I used to assemble these easy crudité platters. I wanted easy-to-cut, easy-to-eat and easy-to-dip veggies for this. 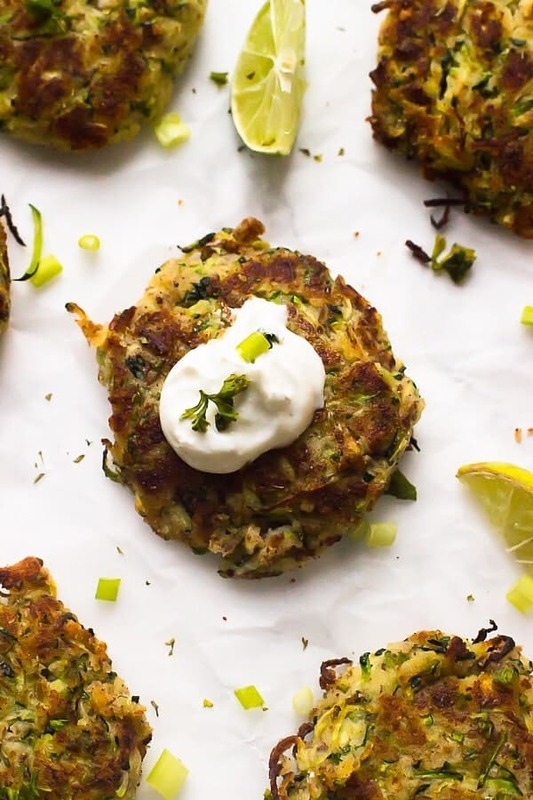 You could also add some cauliflower, broccoli and anything else you love to this list! For the dips for this I used Sabra Olive Tapenade Hummus, 10 oz. and Sabra Roasted Garlic Hummus, 10 oz. The Olive Tapenade Hummus entailed two things I love about easy crudité platters – olive tapenade (by itself) and hummus, so the combination was like a two-for-one effect. The Roasted Garlic Hummus tastes amazing and goes so well with all the vegetables here. You may notice that they’re in these beautiful bowls, which are known as Sabra Bowls! These bowls are handmade by local potters and artisans in NC, VA, CT and VT, for Sabra! Sabra decided to create them because hummus fans (aka people like you and me if you already are) and their consumers directly asked for the bowls since you didn’t want to serve just the plastic containers if you were entertaining or scoop out the hummus and ruin the garnish. Pretty awesome if you ask me. The 10oz tubs fit perfectly into the bowls, and as you can see, they’re gorgeous on your platter! 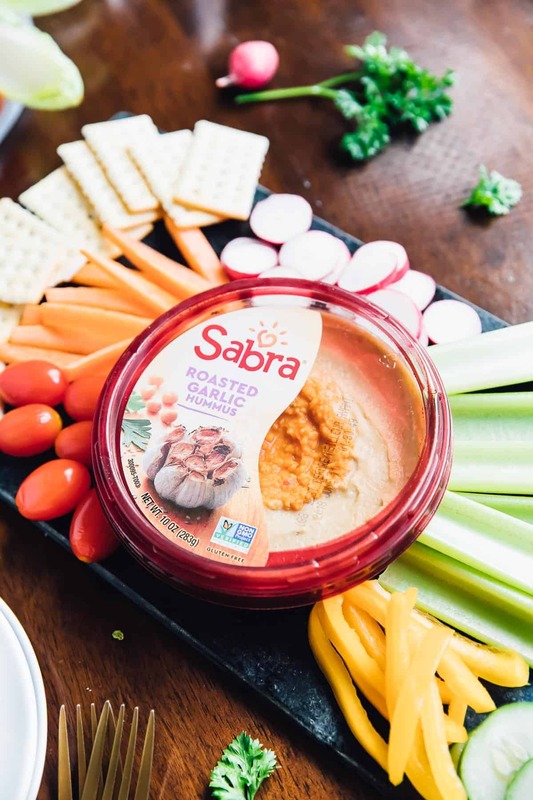 Sabra is actually having an amazing promotion right now – if you buy three Sabra products (doesn’t even have to be in one transaction), you’ll get a free bowl!! This promo will last until August 31, 2018. All you need to do is submit your proof of purchase to SabraBowl.com to get it, while supplies last. You can go to SabraBowl.com to find out more! We split our platter in two since let’s be real, it makes for much easier serving. 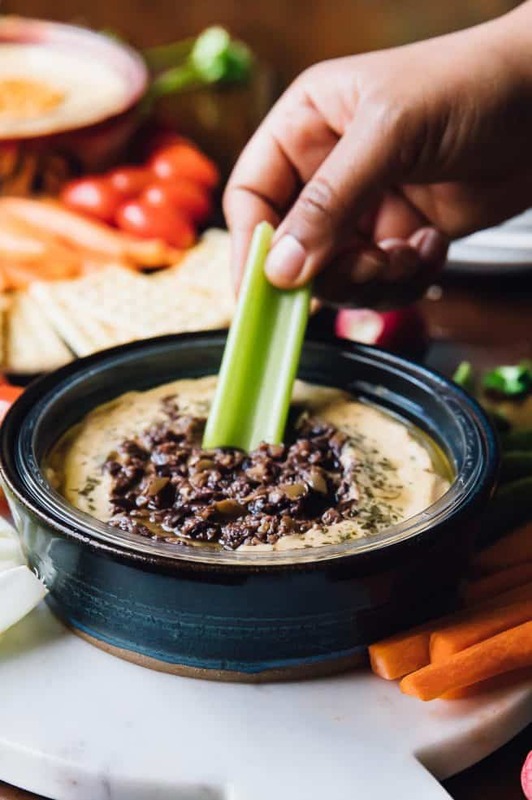 Guests aren’t reaching over everything and they can go for the dip they immediately want to accompany vegetables surrounding it. It feels much more manageable and works for large families, guests, anyone you’re serving! Enjoy friends! There’s a loose recipe down below, but feel free to do your own quantities according to the group you’re serving! Sabra Olive Tapenade Hummus, 10 oz. Sabra Roasted Garlic Hummus, 10 oz. Wash, dry and cut all the vegetables to your desired sizes (I don’t cut the tomatoes since they’re so small and juicy). 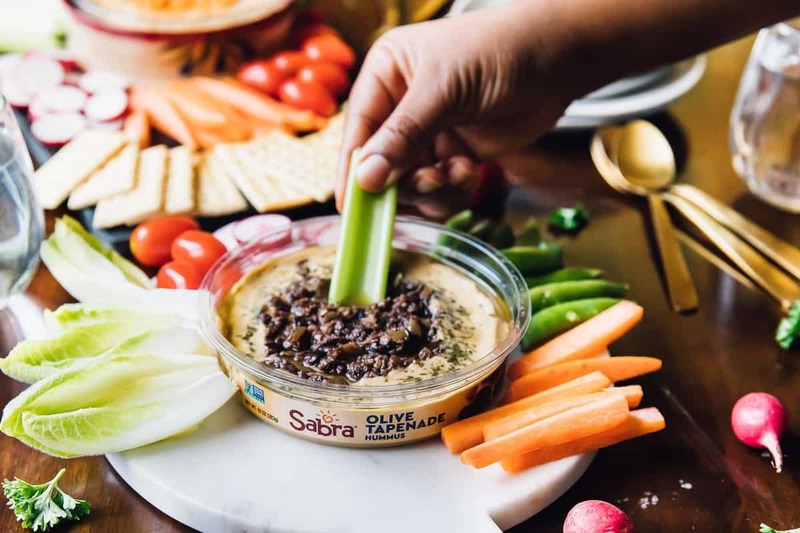 Serve in an attractive manner (like in the photos) around the Sabra Olive Tapenade Hummus, 10 oz. and the Sabra Roasted Garlic Hummus, 10 oz.. Serve with optional breads, pita chips, crackers and pretzels if you like. I recommend cutting the vegetables on the same day that you’ll be serving them so that they are still bright and fresh. If you plan to be using broccoli for this platter, I would recommend blanching it first. HI, I just served something like this to my family! 🙂 It hit the spot with both vegans and nonvegans…. wondering what else I might add that I didn’t think about. Thanks for any tips! Oooo, that’s a great idea about removing the bitterness!!! My hubby, who’s also vegan, has issues with some raw veg, so this is a great tip. Thank you! Thank you so much and so happy that this helps! !